In the summer of this year, Spotted Knapweed (Centaurea stoebe), for the first time ever, has become the latest exotic member of the flora of Texas. Its seeds arrived as a contaminant of a wild harvest originating in the Central or Northern Great Plains, which was purchased by a Texas-based seed dealer. This introduction has many negative ecological implications for the state as a whole, and highlights the many risks and flaws that are inherent and eternal to the wild harvest model (WHM). The initial discovery was made at the Balcones Canyonlands National Wildlife Refuge in Travis County. Because almost all of the native prairies in Texas have been plowed up and converted to “improved” pastures full of exotic species (species that are noxious weeds, regardless of legal listings), and all remnant (unplowed) prairies have been invaded by exotic plant species, some seed dealers elect to supplement their seed stocks by purchasing bulk “wild harvests” from northern seed growers. This is done in addition to harvesting their own locally grown seed stocks. However, those wild harvests are within the distribution ranges of many northern exotic species like Spotted Knapweed (C. stoebe), Dame’s Rocket (Hesperis matronalis), and Smooth Brome (Bromus inermis), and once exotic seed is in the harvest mix there is no getting it all out. A handful of exotic seed is all it takes to start an invasion. This is but one example of many why the WHM has no future in Texas. That model carries too much ecological risk, namely in facilitating exotic plant invasions via non-certified seed. Unfortunately, there are companies who do wild harvests in Texas and sell that seed, which carries equal risk of noxious weed seed contamination, especially the exotic grasses KR Bluestem, Johnsongrass, and Buffelgrass. Grassland restoration in Texas is largely implemented using the select native germplasm model (SNG), first used by the Soil Conservation Service in 1935, now the NRCS Plant Materials Program. The SNG model is being further developed and used with great success by South Texas Natives and Texas Native Seeds (Central and West Texas), modeled after the highly successful Iowa Ecotype Project (now the Natural Selections Program) at the Tallgrass Prairie Center of the University of Northern Iowa. South Texas Natives (STN), a part of Texas Native Seeds (TNS), is a partnership led by the Caesar Kleberg Wildlife Research Institute (CKWRI) of Texas A&M-Kingsville, working on developing certified ecotypic native seed sources, and advancing restoration research and implementation. Texas Native Seeds operates their research and development in South, West, and Central Texas at this time. Certified native seed is the fundamental aspect of their initiative and model. With their model, STN has ensured seed for restoration through 25 ecotypically-appropriate plant releases. Presently, certified seed to re-seed about 30,000 acres annually is available to restoration consumers through cooperating commercial seed companies. Aside from the fact that such seeds are a far better choice simply because of certification standards and a very high quality of cleanliness and germination, the wild harvest model will never match that capacity year in and year out. Nature and land fragmentation work against the WHM — drought and lack of quality harvest sites being the major limiting factors — forcing WHM companies to supplement seed stocks with commercial varieties of native seed. A major economical positive of the SNG model is the lower price point for consumers and a higher profit margin for the producers. More seed per species per acre can be grown using selected germplasms than can be harvested using the WHM. Non-selected germplasms (considered maladapted ecotypes until proven otherwise) generally have a much lower germination rate than selected germplasms, which have consistently higher germination rates and higher genetic purity — which can be readily maintained for best ecotypic use — than the wild harvested seeds, whose genetic purity cannot be maintained (or even known), simply as a fundamental flaw of the WHM. Often, wild harvested seeds are of lower genetic diversity than SNG seeds because most wild harvests in Texas come from a few small, locally isolated stands. By contrast, most SNG seeds are comprised of multiple populations (multiple genetics), with the hope of making the seed products adaptable across a larger region and across multiple soil types. On the issues of the inherent and eternal flaws of the WHM, some might ask, “Why care about which model contains the most or least flaws? What does it matter?” It matters because we have Spotted Knapweed in Texas. Spotted Knapweed has never been in the state before and now it is because of the high risk of seed contamination associated with the WHM. The list below highlights many of the major faults inherent and eternal to the WHM. Origin(s) of WHM seeds are often unstated. While some companies may tell you the origins of the harvest or the seed lots, many will not. Beware of those who refuse to give out that critical information. You, as a consumer, have a right to know where the seed originated from! Wild harvested seed is often 2-3 times more expensive than select native germplasm seed. As a straight comparison, based upon pure live seed (which is unstated for wild harvested seed), certified SNG seeds may cost as little as 1/10th the price of wild harvested seed. Your dollar goes further and covers more acreage using the SNG model. Because the wild harvest model is limited to sites that are large enough to make it cost effective for the use of combines and labor, so too are the genetics within each site limited. The vigor of plants in the populations from which the seeds are harvested is unknown. Plant vigor and performance is critical to restoration success and competitive ability amongst the many exotic species in the state. Areas of adaptation of wild harvested seed is not known. They are untested and unproven in many areas. Local-only purists are often against evaluation of plant adaptations and performances because they believe that scientific aspect somehow doesn’t fit in with their narrowly-focused narrative of “true” prairie restoration. Evaluations prove potential restoration success on a species by species basis, and certification proves origin. In most SNG seed sources, great care is taken to not alter the original genetic makeup of wild populations. High quality, clean seed is the key to restoration. No matter how carefully the seedbed preparation and planting is done, using wild, maladapted seed sources will usually lead to planting failure. Often, those who experience failure when using questionable seed sources do not try again with native species but instead use exotic species, which further perpetuates many of the problems grassland ecologists are dealing with. Certified native seed of selected native germplasms is the only way to go in helping to maintain native plant communities against exotic species increases and implement successful restoration plantings. In summary, if the seed you are looking to purchase isn’t certified native seed as regimented under a state agricultural program, if no origin information is given or the seed grower won’t or “can’t” tell you the origin (listing county of origin does not in any way give up a collection source), if it’s not sold on a Pure Live Seed (PLS) basis and only on a bulk pound basis with no germination rate(s) given, then it’s a crapshoot and is anyone’s guess as to what really germinates in a planting. And thanks to the many holes within the wild harvest model, we now have Spotted Knapweed in Texas. The use of certified seed could have prevented this! If you have purchased non-certified native seed from a Texas-based seed dealer at any time in the last two years, you are at risk for having Spotted Knapweed in your planting(s). Many ecologists expect Spotted Knapweed to show up outside of Travis County, especially along roadsides and in private plantings where its population increases are expected to be highest, simply because private landowners are less strict in their monitoring. Jones, T.A. 2013a. When local isn’t best. Evolutionary Applications. 6:1109-1118. Jones, T.A. 2013b. Ecologically Appropriate Plant Materials for Restoration Applications. BioScience. 63(3):211-219. 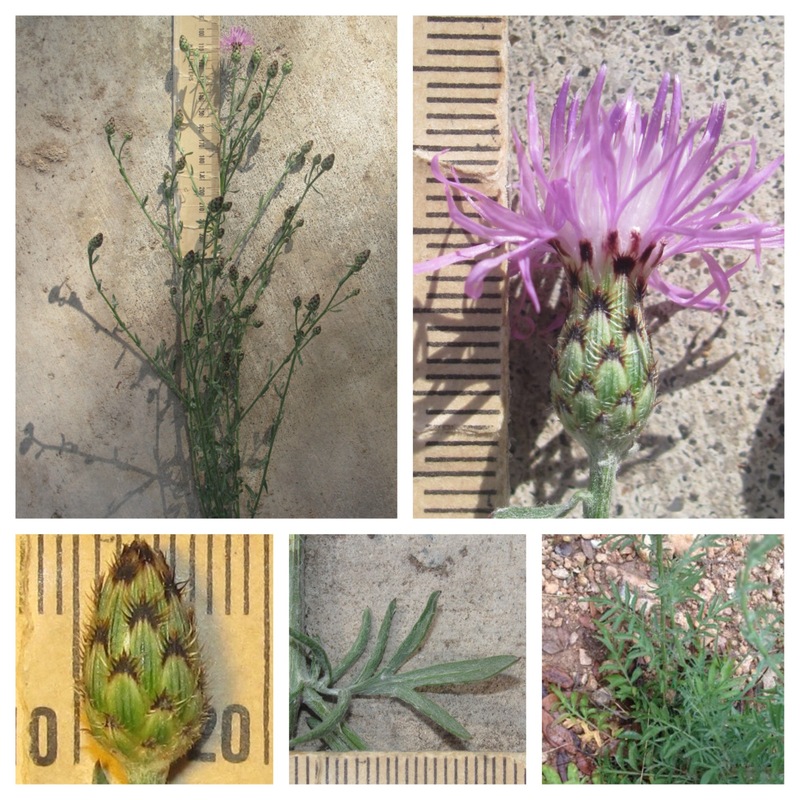 From left to right, top to bottom: Plant view of Spotted Knapweed; flower; flower bud; midstem leaf; and basal leaves. Photos courtesy of USFWS Balcones Canyonlands. Do not confuse Spotted Knapweed with the native forb American Basketflower (Plectocephalus americanus [new name] Centaurea americana [old name]). Tagged appropriate ecotype, bulk wild harvests, certified native seeds, exotic ecotype, exotic species, inappropriate ecotype, local ecotype, regional ecotype, selected seed, spotted knapweed discovery Texas, spotted knapweed in Texas, spotted knapweed texas, Texas Native Seeds, wild harvested seed.